Be sure to enter to win 4 day passes to Castaway Bay Indoor water park here!!! Every winter I start to daydream about a tropical island vacation when the snow is on the ground here in Michigan. However, actually going to the islands is not always in the budget. That is why most winters, we head to the next best thing – an indoor waterpark. It is the budget alternative to an island getaway. Two years ago I found a great price on a room at Castaway Bay Indoor Water Park owned by Cedar Point in Sandusky, Ohio and we went for the weekend. We had an amazing time. That is why we were ecstatic when I found out that my family was lucky enough to be invited to a blogger event at Castaway Bay Indoor Water Park last year and this year. Castaway Bay is just over 2 hours from Metro Detroit and an easy drive. Perfect for a little getaway. With a tropical Caribbean theme, guests at Cedar Point’s Castaway Bay will feel like they have just landed on an island paradise upon entering this lush indoor waterpark resort. The centerpiece of Castaway Bay is its elaborate enclosed waterpark with a five-story structure featuring a vaulted wood ceiling that covers a natural setting of palm trees, huts, inland lagoons and plenty of wet and wild water adventure. It is always 82 degrees in the waterpark which is a much needed respite from the winter cold. We stayed in a Starfish Bayview room. It was a standard hotel room but also included a microwave, refrigerator and coffee maker. 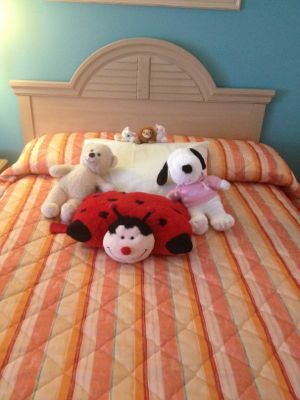 Housekeeping even nicely arranged all the girls stuffed animals when they cleaned the room. If you need a bit more space, Castaway Bay also offers some suites that will hold up to 6 guests. Be sure to always check their website for specials and packages. Some even include food, arcade credits and a picture with a Peanuts character. 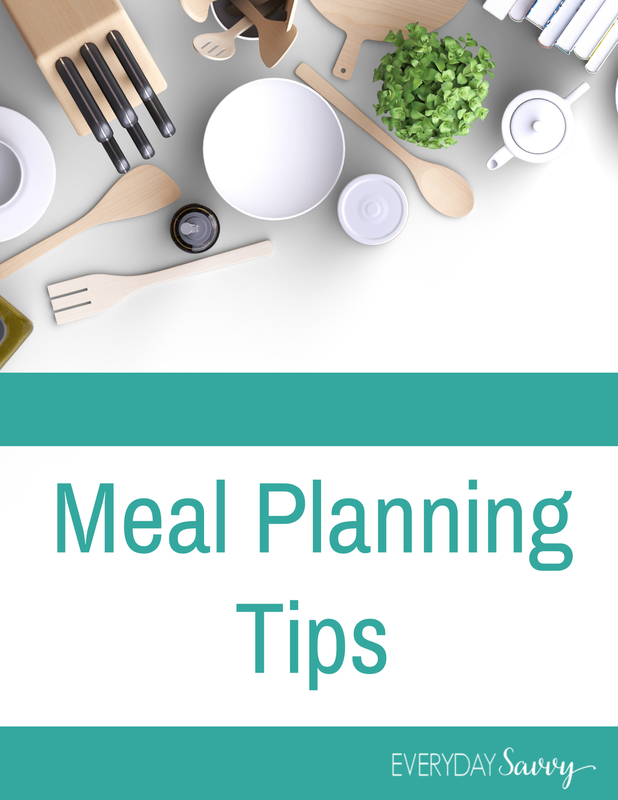 With the microwave and refrigerator you can even choose to save money by having some meals in your hotel room. Castaway Bay does have a bunch of on site dining options too. Big Daddy’s Snack Shack is located within the waterpark. Menu items include pizza, wings and breadsticks, hot dogs, warm pretzels with cheese, fresh made deli sandwiches, nachos with cheese, salads, soft serve ice cream, cookies, beer, soft drinks and ICEE frozen drink. We grabbed lunch here and it was your typical amusement park fare. We all enjoyed the pizza and hot dogs. Mango Mike’s breakfast buffet is located on the first floor to the right of the main lobby area, just past Ebb & Eddy’s. The breakfast buffet features fresh fruit, freshly-baked pastries, scrambled eggs, cold cereals, hash browns, pancakes, french toast, biscuits and gravy along with breakfast favorites. Mango Mike’s is open select mornings based on occupancy. Located adjacent to Castaway Bay Resort, TGI Friday’s features tempting appetizers, popular entrees, including items from the Jack Daniels Grill, and delicious desserts. Full bar service is available. When we visited, they had a 2 meals for $20 special that was a great deal and a much better value than the everyday menu. There are plenty of chances to meet a Peanuts character. You just need to check the Island Times schedule you get when you check in. When we visited they had Karaoke & Peanuts, a dance party with a Peanuts character (both times we visited it was Lucy) and movie and a story with Snoopy. 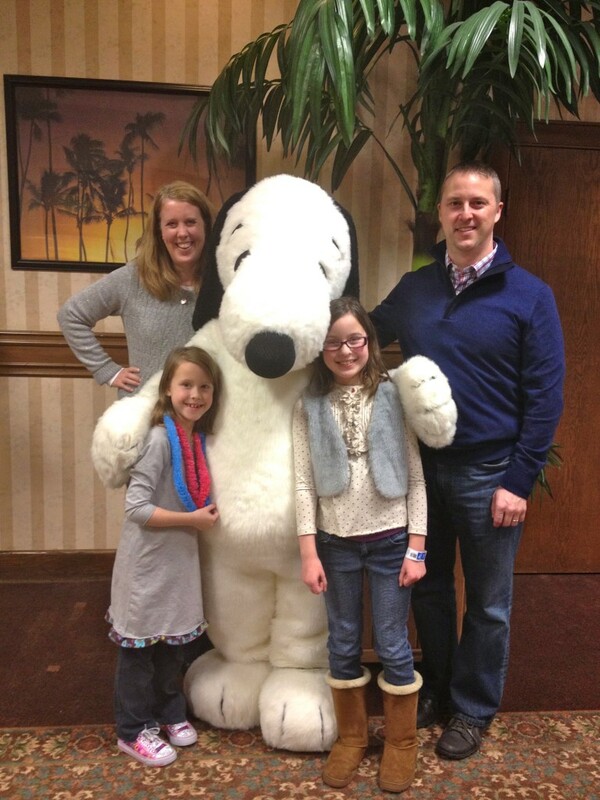 The even offered free hot chocolate with Snoopy before bedtime. The main attraction is obviously the indoor waterpark. There is so much to do but the place isn’t so big that you are worried about losing your kids. The lifeguards were excellent and if a child is not tall enough to have their head above water in the pools, the lifeguards will ask them to put on a life jacket. Our family’s favorite rides include the Rendezvous Run which is a water roller coaster. A rousing 35-foot-high, 520-foot-long water roller coaster that propels riders uphill using water jets. This unique water coaster twists its way through the waterpark, shoots outside the resort’s structure in an enclosed slide and then spirals back into the complex. It has some thrill but isn’t too scary. We also loved the Tropical Tube slides. We would race each other and see who arrived at the bottom first. The weekend we were at Castaway Bay we rarely had to wait at all for the slides and rides. If you have little ones Toddler’s Tide pool is perfect. You must be less than 52 inches tall in bare feet or accompanied by a child to participate in this area so you don’t have to worry about older kids intruding on the little ones. I was also very fond of The Grotto which is two 50-person whirlpool spas — one indoor and one outdoor . They are connected and you can relax to your hearts content. My daughters thought it was pretty cool to be outside in a hot tub in the winter cold as well. I highly recommend going on a Friday afternoon. There were no lines or crowds. 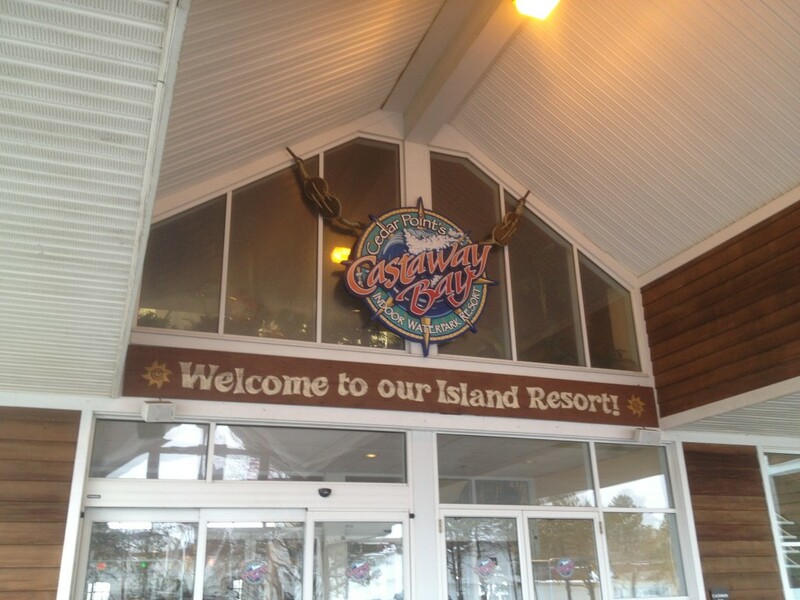 Next time you have one of those random Fridays off of school, you should consider Castaway Bay. It is a wonderful fun filled getaway. 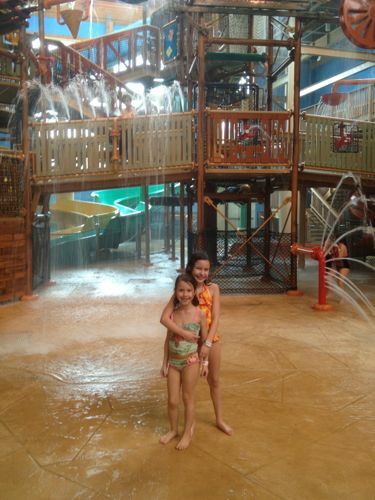 If the kids need a little waterpark break during the day, you can check out Club Castaway and Camp Castaway. Camp Castaway is a kids retreat. Kids of all ages can enjoy free crafts, toys, books, board games and much more. Club Castway has a few paid crafts. 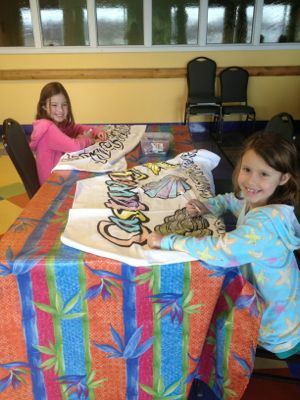 You can be the artist of your own Castaway Bay backpack, towel, or T-shirt. There is a $5 charge for backpacks, $10 for t-shirts and $15 for the towels. My girls loved coloring the towels. As you can see in the picture they are very nice sized as well! I had so many pictures that I couldn’t fit them all in this Castaway Bay Waterpark review. Here is a quick video with more pictures from our visit. You can see we had an amazing time. 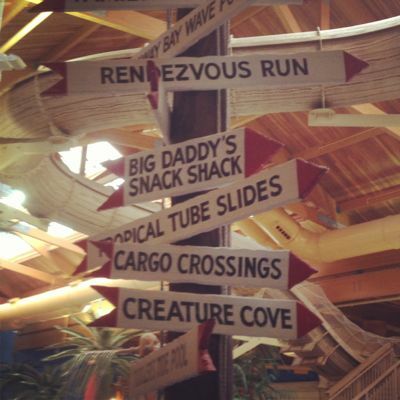 Next time you are looking for a bargain tropical getaway, be sure to check out Castaway Bay Indoor Water Park. Disclosure: Many thanks to the Castaway Bay for complimentary 1 night lodging, dinner and activities for me and my family. The review shared is based on my own experience. Others may have a different opinion or experience. It was so great to meet you at Castaway Bay! My husband and I were really impressed with the water park and I appreciated that even though my teens didn’t accompany us with the little ones, there were elements they would have really enjoyed. I could see them spending time in the wave pool and on the roller coaster ride. That was just too cool. It was so great to meet you too. I agree that Castaway Bay is great for little ones and older kids alike. My girls love the water roller coaster. They rode it so so many times. This looks like a fun place! My kids would love it. It is super fun. I am sure your kids would love it. So nice to get out if the cold.